When going for this summer nautical look, styling is crucial. With the right pieces you can easily dress a look up or down. For a more casual look, you can add a simple metallic sandal and delicate gold jewelry. To dress up the dress, just add pops of color! Think of a bold heel and statement earrings that balance out the neutral look. When going honeymoon shopping, I was so excited when I found this blue and white striped ruffle wrap dress from guess where?! TARGET! I felt like it was perfect for Greece, but still versatile where I could wear it multiple times this summer. Like many frugalistas, I am mildly obsessed with Target. I always check the weekly ads and Cartwheel App. I had spotted this dress a couple weeks prior but didn't really want to pay the $27.99 price. I waited and sure enough there was a promotion for Buy One Get One 50% that I jumped on! Definitely worth the wait. Blue and white is SO in! It gives a nautical fresh vibe that is very summer. 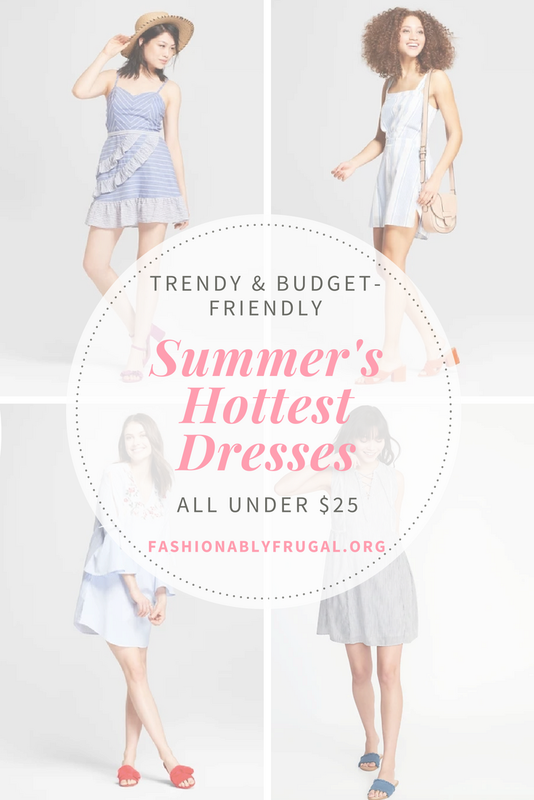 Check out these frugal options to lighten up your wardrobe this season with such a versatile piece!